OAKVILLE, ON, Sept. 26, 2018 /CNW/ - Hockey fans rejoice! Today, Tim Hortons announced the return of the 2018-19 Tim Hortons® NHL® Trading Cards. Guests can now purchase a pack of Tim Hortons® NHL® trading cards for $1.00 plus tax, with the purchase of a qualifying beverage (or $1.99 plus tax, without beverage purchase). 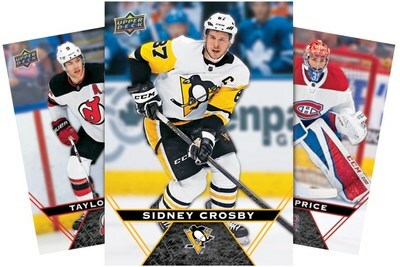 This year, the Tim Hortons NHL® Trading Cards are back and better than ever, giving Canadians across the country a shot at collecting some of the most coveted cards, including: 87 Sidney Crosby Superstar Signature Cards, 150 autographed NHL® Jersey Relics Cards and 100 autographed Brad Marchand Timbits® Hockey Cards. Hockey card collecting gives fans the chance to truly feel connected to not only their collection, but their love for the game and passion for hockey. "When I was younger, hockey card collecting was a way that I could extend my love for the game beyond the ice," said NHL star Sidney Crosby "As a kid, holding that hockey card in your hand was being just about as close to your favourite player as you could be. Nate and I are excited to be a part of this program once again and to help bring the love of hockey cards to hockey fans across Canada." Tim Hortons has a long-standing commitment and passion for hockey and this year we're inviting more guests across the country to get in on the trade. Communities across the country can also share in the enjoyment by getting involved through a series of local Hockey Card Trading Nights on October 18 and 25 at select Tim Hortons restaurants across the country. The Hockey Card Trading Nights give hockey fans new and old, the chance to land new hockey cards, meet fellow collectors and enjoy your favourite products from Tim Hortons. "We've always had a special connection to hockey, from our founder Tim Horton to our national sponsorships and community level programs across Canada," said Jorge Zaidan, Head of Marketing, Tim Hortons Canada. "From coast-to-coast, we see how excited our Guests get for the hockey season and we look forward to celebrating Canada's game with them each year. We are thrilled to once again give them the opportunity to collect, trade and win with the 2018-19 Tim Hortons® NHL® Trading Cards." Trading will extend online as each physical pack contains a unique PIN code for www.collecttowin.ca, an online hockey card trading platform. This is where Canadians can work to meet their collection goals for a chance to win a meet and greet with Sidney Crosby! Other incredible prizes include tickets to the 2019 Honda NHL® All-Star game, a Sidney Crosby autographed jersey, $300 Tim Cards, $100 Tim Cards and tons of free coffee prizes. New this year, our most passionate hockey fans can "score" our special-edition hockey themed donut box and cups: That's right - Tims is giving more ways for fans to get in the game with our interactive hockey-themed donut box and limited-edition hockey trivia cups. 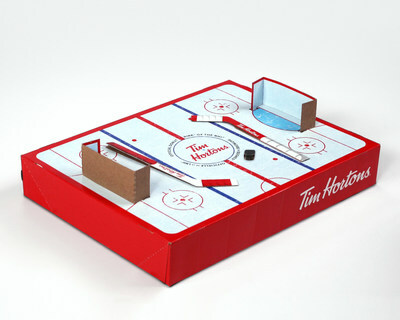 Guests simply need to flip the box over to reveal perforated goals, pucks and hockey sticks - providing you with an "Official Donut Rink™ of the NHL®" to get in on the game with friends and family! Tim Hortons encourages hockey fans and friends to join the #CollectToWin excitement online by following and tagging us on YouTube, Facebook, Twitter, Instagram and Snapchat. Visit www.collecttowin.ca to find out when and where your local trading zone takes place! NHL and the NHL Shield are registered trademarks and the NHL All-Star logo is a trademark of the National Hockey League. All Rights Reserved.